Trayvon Martin’s parents, Sybrina Fulton and Tracy Martin, said they are shocked and disgusted the jury in George Zimmerman’s trial found him not guilty of murdering their son. George Zimmerman, 29, was acquitted of both second-degree murder and manslaughter on Saturday night after a month-long trial that gripped and divided the nation. 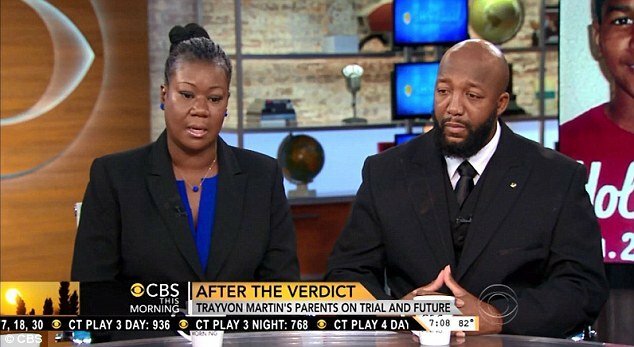 Trayvon Martin’s parents, who both testified their son was screaming for help on a 911 call that was a crucial piece of evidence in the trial, made a string of TV appearances this morning to talk about the verdict. “I really didn’t believe that he was not guilty. My first thought was shock, disgust. I think people are forgetting that Trayvon was a teenager so he probably thought as a teenager,” Sybrina Fulton told Good Morning America. Tracy Martin said: “I wish they really knew Trayvon for who he was and knew that he was a kid. They didn’t know him as a human being, a very decent human being, a fun-loving kid. He loved kids. George Zimmerman’s parents, Robert and Gladys, spoke to Barbara Walters this week and said that if they had the chance, they would tell the couple they are truly sorry about what happened the night their son fatally shot 17-year-old Trayvon Martin. When asked whether he was comforted by this, Tracy Martin called it a “hard and fair question”. “There’s no winner in this situation,” he said. “Obviously, we are devastated more. “I just think that all the circumstances surrounding books being written and the mischaracterization of us as parents, I just really don’t feel that it’s real sincere. Tracy Martin and Sybrina Fulton have started a foundation named after their son and say they hope his death and the trial can serve as a catalyst to bring the country together. “I think moving forward we need to educate ourselves as a community on the gun laws, on the laws, on the statutes. We need to come together more as a whole, not individual people, not individual races, religions. We need to come together as God’s people. Today was the first day the two had spoken out about the verdict on TV. They also appeared on the Today show where they told Matt Lauer they are still in disbelief over the verdict. “Is this the intent for the justice system to have for victims. Trayvon wasn’t doing anything wrong,” Tracy Martin said. When asked if they would like to say anything to the jury, he responded: “How can you let the killer of an unarmed child go free? “What would your verdict have been had it been your child? And there’s no winner in this case at all. It’s just, I want them to put themselves in our shoes. “Obviously anytime you have a person that makes an assumption that a person is up to no good, there’s some type of profiling there. Was he racially profiled? Sybrina Fulton said she felt the jurors and the justice system failed her son “to a degree”. “We let the process take its course. We didn’t get the verdict that we were looking for because we wanted [George Zimmerman] to be held accountable. When asked about forgiveness for George Zimmerman, Tracy Martin said “forgiveness takes time”. “I think that the forgiveness is like a healing process, forgiven takes time,” he said.